When adding a new patient to your account you will have to assign them a password. They will use this password along with their email to log into their My Rehab Connection app. It is the login that allows their app to be linked with their file on your My Rehab Connection web portal. The patient can change this password from their app. By default the software will assign the patient a random alpha-numeric password (this is what will happen if you simply leave the password filed blank). 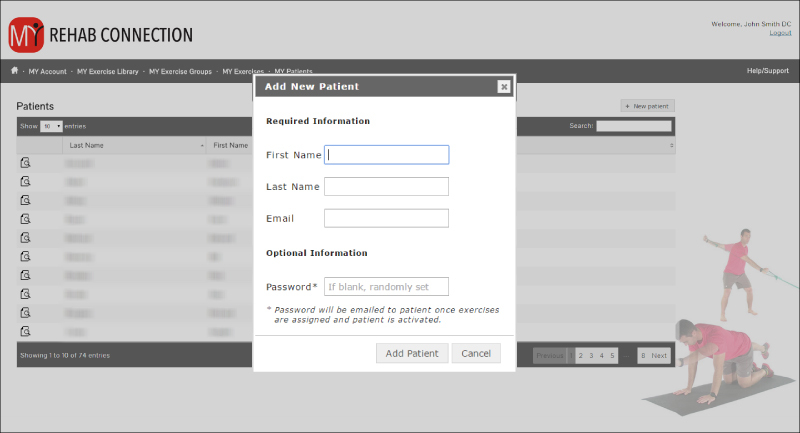 You also have the option of creating a password for the patient. Simply type the desired password into the password field. You may find that using a standard password such as a simple variation of the patients name follwed by a simple number sequence will be easier for the patient. Remember to tell the patient that they can change this password from their app after they login. Note: Once created you will not have access to your patient’s passwords. If your patient forgets their password they can reset their password directly via their app login screen.